Arsenal manager Arsene Wenger addressed the media in his final pre-match press conference and had a message for his potential successor. Wenger’s 22-year tenure as Arsenal manager will come to an end at Huddersfield on Sunday and speculation continues to mount over who will replace him, with the likes of Massimiliano Allegri being linked with role, according to the BBC. As per the BBC, Luis Enrique has also been touted as a potential managerial candidate having previously worked with Arsenal’s head of football relations, Raul Sanllehi, at Barcelona. 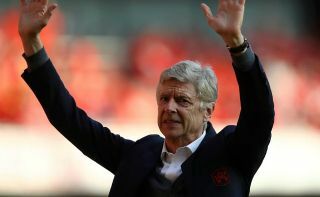 It’s also reported by the BBC that the Arsenal hierarchy are keen to appoint Wenger’s successor before the start of the World Cup, a sensible decision as it will give the new man plenty of time to settle and prepare his new squad for the upcoming pre-season schedule and campaign. But whoever takes over from Wenger, he has advised his replacement to adhere to the values and ideals the club has built, which has seen Arsenal become one of the most recognisable clubs in the world. “The advice is to give his best and to respect the values of the club,” said Wenger, as reported by Sky Sports. “This club is respected all over the world. I would like him to bring his own ideas, his own speech, a different way of seeing the game. It’s a chance for the players to see something different. Wenger will hope that his side can help him sign off with a win against David Wagner’s side on Sunday, but it doesn’t look particularly promising as they’ve not taken a single point away from home in the Premier League in 2018.